Hair is mostly protein, one of nature's polymers. it is a chemical, its pigments and proteins are all chemicals, how these chemicals give color and structure to hair is an interesting study by itself, animation details out medulla, cortex, cuticle, keratin, melanin, eumelanin and phaeomelanin, and gives the hair protein structure. 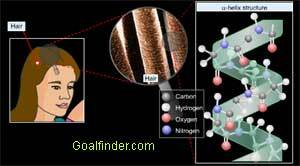 This animated topic gives in-depth information chemistry and structure of hair. What is the structure of hair protein? What is chemical composition of hair? What is Medulla, Cortex, Cuticle? Which amino acids are present in hair? Which chemical is responsible for coloring of hair? Content of the science animation : Hair is mostly protein, one of nature's polymers. The structure of protein in hair is a-helix structure.The structure of protein is depend on the position of the C=O---H-N hydrogen bonds. The innermost layer of the hair is the medulla. This layer of hair is often missing in fine hair or light blonde hair. Its purpose is unknown. The middle layer of the hair is the cortex, responsible for giving the hair its elasticity, tenacity, and strength. It is in this layer that pigment, the substance that gives color to the hair, is found. In this layer, chemical changes take place, once the cuticle has been penetrated. Hair is composed of a fibrous protein, keratin, which originates in the hair follicle. The hair is made up of long amino acid chains joined to each other by peptide bonds. The hair gets its color from a pigment known as melanin. The color of a person's hair is determined by their genes. Melanin is produced by melanocytes, cells that exist near the hair bulb. They collect and form bundles of a pigment protein complex called melanosomes. There are two types of melanin, eumelanin which is brown/black in color and phaeomelanin which is red. Ans: Pore size is largely determined by genetics, If your parents had large pores, you will likely have them as well. However, your lifestyle (i.e., sun exposure) plays a key role in how they shape up in adulthood. Typically the pore diameter is only 50 microns. 1 micron = 1/1000 millimeter and the diameter of human hair is 80 to 100 microns. So guess this is the maximum dia a molecule must have to pass through the hair pore. Ans: Zinc is non-steroidal inhibitor of 5 alpha-reductase activity the regulator of DHT production, very effective in combination with Vitamin B6 and Azelaic Acid. Hair protein structure alters, when zinc is deficient. Zinc is needed for body’s growth. It plays a major part in production and processing of 42 vital enzymes, in cell production, tissue growth, protein synthesis, collagen formation & repair and maintenance of the oil-secreting glands of the scalp. It is useful in dandruff prevention. Ans: Sanaz, the above animation deals with the structure and chemistry of hair, what you need, is in a project on hair science, under research and development in our company in which we are going to explain about trichology and the skin of scalp. But it will take some time. We are sorry that we are unable to help you out with this. Ans: The answer is yes, but the degree of absorption varies. 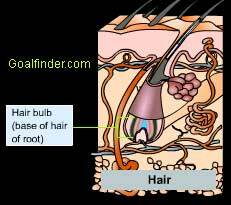 Scalp, pore, hair follicle are all skin & have a cell membrane. All oil and egg yoke contain lipids (fats) or proteins. Molecular weight decides permeation. If the molecules are small, they are absorbed. Simple lipids found in topical creams are absorbed into the skin while complex ones of sun cream only coat the outer layer of skin and make it greasy but cant get through. Alcohols pass through easily, glycerol, urea, glucose take longer.